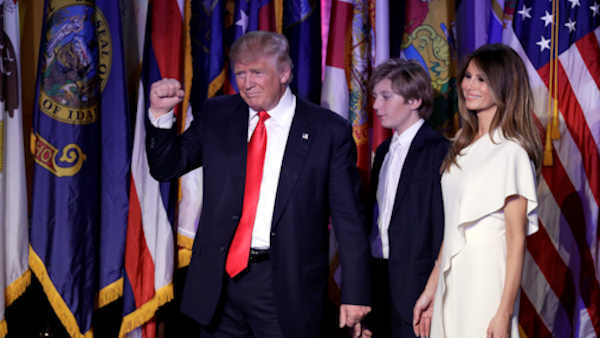 BEDMINSTER, New Jersey -- Donald Trump says his wife, Melania, and their son, Barron, will move to the White House "right after he finishes school" next year. An aide to the president-elect had suggested earlier that the Trumps are reluctant to move their 10-year-old son from New York to Washington during the school year. Trump will be inaugurated as the nation's 45th president on Jan. 20. Most American schools finish the school year in the late spring or early summer. Trump made the remark Sunday at his golf course in New Jersey as he was escorting Kansas Secretary of State Kris Kobach from a meeting. It was only one of a string of sessions Trump has been having with prospects for posts in his administration.